UCMMA 50 goes down at The Troxy, London on February 4 with a fight card that features four UK1 kickboxing fights including, Mike Neun vs. Andy Cunningham as the co-main event for the latter’s UK1 heavyweight title. The headline fight is, Arunas Andriuskevicius vs Denniston Suthlands for the UCMMA light-heavyweight championship. UCMMA events are always MMA focused, however, they do feature a small volume of UK1 kickboxing bouts, especially as a fair amount of UK MMA fighters come from striking backgrounds. For example, UFC heavyweight Jimi Manuwa and BELLATOR welterweight, Micheal ‘Venom’ Page – both of whom fought for UCMMA, before signing for two of the world’s biggest promotions. UK1 is basically K1 rules with either, 10oz boxing gloves or sometimes, even 4oz MMA gloves, in a MMA cage instead of being fought in a usual boxing ring. Interestingly, BAMMA welterweight Terry Brazier will be making his UK1 debut at UCMMA 50 against, David Round for the 84kg UK1 title. Also Paul Dash takes on Dontel Forrester in a 72kg match-up under UK1 rules and Daryl Field vs. Tommy Kelly will also feature as an 80kg bout under UK1 rules too. UCMMA 50 is available to Pay Per View (PPV) via MMA TV. 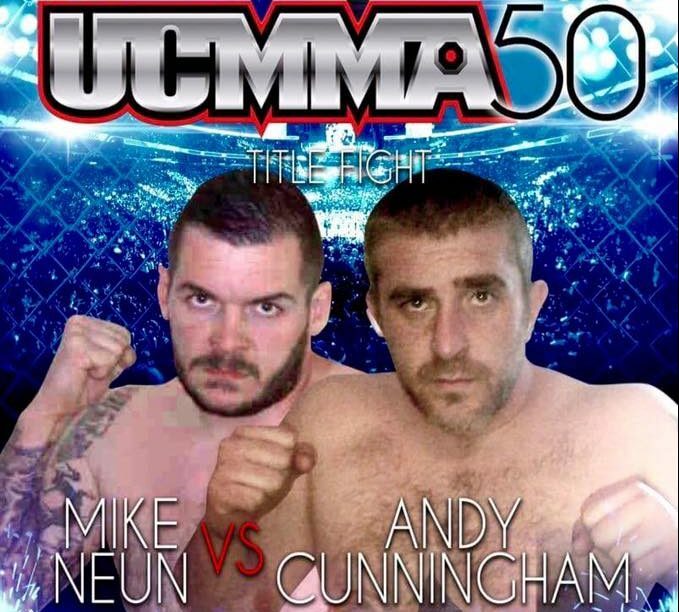 Mike Neun vs Andy Cunningham will feature as the co-main event for UCMMA 50 in London for the UK1 (kickboxing) heavyweight title on February 4, 2017. The title fight will be a rematch between the two heavyweights who, had previously fought each other last year, with Cunningham stopping Neun in their previous encounter. Neun explains why this rematch will be his retirement fight and shares some deeper thoughts and opinions on the changing landscape of MMA and much more.